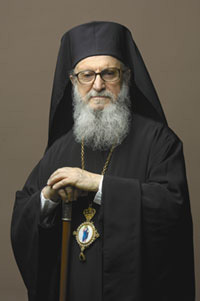 Archbishop Demetrios (Trakatellis) of America was born in Thessaloniki, Greece. In 1950 he graduated with distinction from the University Of Athens School Of Theology. He was ordained a deacon in 1960, and a priest in 1964. He was elected Bishop of Vresthena in 1967, auxiliary to the Archbishop of Athens, responsible for the theological education of the clergy. From 1965 to 1971, he studied New Testament and Christian Origins at Harvard University, and was awarded a Ph.D. “with distinction” in 1972. He earned a second doctorate in Theology from the University of Athens “with distinction” in 1977. From 1983 to 1993, he was the Distinguished Professor of Biblical Studies and Christian Origins at Holy Cross Greek Orthodox School of Theology in Brookline, Massachusetts. He also taught at Harvard Divinity School as Visiting Professor of New Testament. He was inducted in 2003 into the Academy of Athens as a member who resides abroad. In August 1991 he was elevated to be the Titular Metropolitan of Vresthena. On August 19, 1999, he was elected Archbishop of America by the Holy and Sacred Synod of the Ecumenical Patriarchate. He was enthroned on September 18, 1999 in New York City. In over a decade of leading the Greek Orthodox Archdiocese of America, with more than one and a half million members in the United States, he has touched and inspired the lives of thousands of people with his incessant, methodical and loving archpastoral ministry. As Exarch of the Ecumenical Patriarchate, he is the Chairman of the Assembly of Canonical Orthodox Bishops of North and Central America. He has been the recipient of many governmental, ecclesiastical, interfaith, and academic honors, both in the USA, Greece and Europe.